When Nancy moved back to Portland in 2007 after 20 years in the suburbs, she initially missed the wild, green and quiet outdoor spaces that had become a part of her daily diet. Happily, she discovered the Portland Trails network and the trails provided her fix for the outdoors. She quickly became a regular trail user, whether on foot, bike, or skis, and especially enjoyed the diversity of our trails and the proximity to and accessibility from almost every neighborhood in the city. She eventually became a major Portland Trails cheerleader and served on the Board in 2009 and 2010. 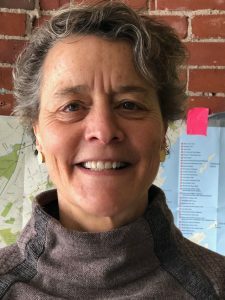 As Executive Director of the Bicycle Coalition of Maine, from 2011 to 2017, Nancy regularly crossed paths with Portland Trails staff and board members and increased her appreciation of how integral the trails and the Portland Trails organization are to all that makes Portland great, including quick and easy access to nature, a small-town community, shared appreciation of outdoor recreation and active transportation. She is thrilled to be joining the staff as the Advancement Officer and hopes she can help expand Portland Trails’ visibility in Greater Portland and beyond along with its financial capacity so we can continue to grow. As Advancement Officer, she will cultivate and steward potential and current private and corporate donors and oversee the strategic communications plan. She loves to share the trails with others so feel free to reach out to Nancy for a guided walk and talk.